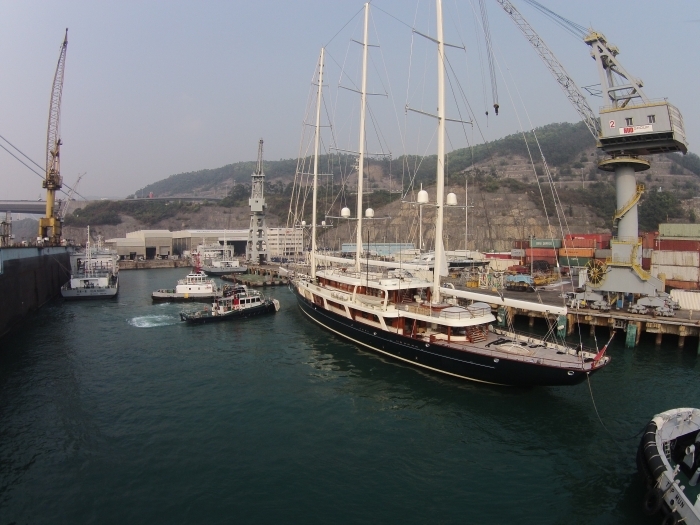 HUD is proud to have been the shipyard of choice for the world’s largest sailing superyacht EOS which docked here to take advantage of HUD’s Yacht Repair services . Built by Lurssen Yachts in Bremen and launched in 2006, the 93m three-masted Bermuda rigged schooner has an aluminium hull with a beam of 13.50m (44.29ft) and 5.5m (18.04ft) draft. This luxury yacht offers accommodation for up to 16 guests, and carries up to 21 crew. EOS called on HUD to assist with hull maintenance and underwater repairs including the replacement of the bow thruster motor, servicing of the Naiad stabilizers, interim GL survey, rudder and shaft bearing clearance check, propeller polishing, anode replacement and bottom painting. Following the successful completion of all works EOS continued on her Asia cruise itinerary.